The wind-driven Hurricane Ventilator exhausts hot, stale air from buildings, and allows it to be replaced at low level with fresh air at ambient temperature, resulting in a more pleasant working environment. It also prevents condensation by exhausting the moist air. In case of a fire break-out, the Hurricane Ventilator ensures safety by exhausting smoke and fumes from the building. 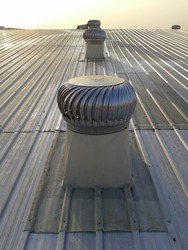 We are the manufacturers and exporters of Roof Air Ventilator. 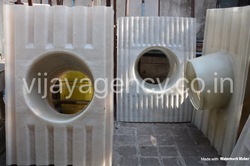 Wind air ventilators method is very useful method to take out the heat from any closed room or telecom tower rooms as well as these wentilators are used in many industry to take out the heat without using any electrical appliences like air cooler or AC's to stop the usage of electricity. We are engaged in offering our clients with superior quality Powerless Air Ventilators. These are widely acclaimed by our client for the industry specific design and other characteristic features. It exhaust the air in industries.